When it comes to security, all you can ask for is a solution that is consistently effective. 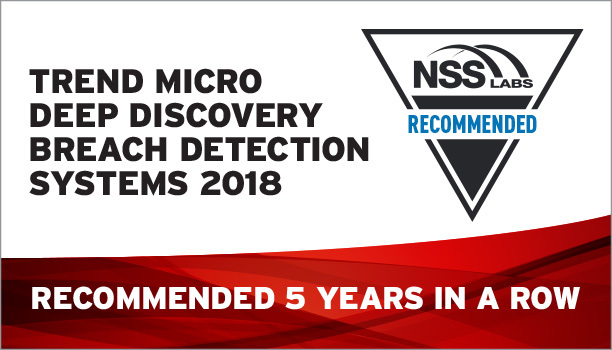 For five years, Trend Micro has been included in the NSS Labs Breach Detection Systems Test, and in those five years, we have consistently received a recommended rating. In 2018, five vendors were tested, but only three could produce measurable result, including Trend Micro. Trend Micro achieved a 98.7% detection rate. Year after year, Trend Micro continues to demonstrate leadership in breach detection with recommended achievement, proving that Trend Micro™ Deep Discovery™ is your solution to ward off advanced threats and ransomware. Want the full results? Fill out the form to download a copy of Trend Micro’s 2018 NSS Labs Breach Detection Systems Test results. Deep Discovery wards off advanced threats and ransomware with industry-leading effectiveness.